MUCH of next week will be spent speculating over which players Jim Gavin will grant precious game time to against Roscommon in a match that has no material significance and falls just six days before their All-Ireland semi-final. Recent comments suggest Gavin is reluctant to simply grant Championship starts to players who he feels haven't earned them. After they beat Wicklow with a team stacked heavily with All-Ireland winners in the opening round of the Leinster SFC, Gavin was asked whether he had considered experimenting his team selection, given the paucity of opposition. "I don't think we've ever done experimentation," Gavin announced. "Jerseys are earned. Those players who represented the county, the 21 players who played earned that right." And last Saturday in Omagh, when asked if the deadness of next Sunday's rubber would force a change in policy with regards team selection, Gavin responded with a blunt and direct "no". Yet for as much as Gavin might deem some of his erstwhile subs worthy of a start against Roscommon, he also has a handful of players who have become so important to the team, they could benefit by being rested so close to the semi-final on August 11. Described by none other than Colm Cooper as the "most affective (sic) player in Gaelic football right now" although his ram-raiding goal in Omagh masked an under-par performance. McCarthy was dispossessed an unusually high number of times against Tyrone and his handling was frequently poor yet he remains the undisputed warrior of this Dublin team. Gavin may well decide that more game time is required to sharpen his skills but McCarthy is proven a big game player, who should have no problem rebooting for the All-Ireland semi-final, regardless of whether he plays him in midfield or wing-back. Has played every minute of Dublin's five Championship matches so far, although he never seems to be tire. 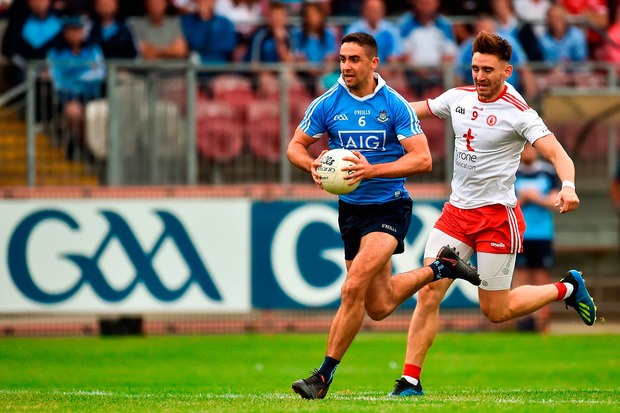 Blessed with natural athleticism and though he was stunted in his ability to cleanly catch kick-outs last Saturday in Omagh by Pádraig Hampsey, Fenton still drove Dublin forward with every single possession. If McCarthy is the warrior of this team, Fenton is its beating heart and his continued well-being is of optimum importance for Gavin. Against that, Gavin isn't particularly well endowed with midfield options, particularly if he elects to rest McCarthy. Touched the ball 17 times in the final eight minutes of Dublin's victory over Donegal, evidence of the duality of his role now. Kilkenny has spent patches of games in his old full-forward posting and has scored more goals this season than he did in the first five years of his inter-county career. Then, as the situation has arisen on consecutive weeks against Donegal and Tyrone, Kilkenny becomes the orchestrator of Dublin's slow strangulation of their opposition. He also set up Dublin's goal in Omagh. For all the flinty edge Cooper has added to his game over the past couple of seasons, he remains the cleanest tackler in football and arguably the best defender in the game at present. Like Kilkenny, cradles the ball with superb confidence and safety when required but carries out the more traditional tasks of his position with increasing authority. For all Dublin's variation of style in defence, Cooper is the one they can least do without just now. WITH both Con O'Callaghan and Paul Mannion struggling to convert their endeavour into scores, Rock's (inset left) importance to the team has become even more pronounced. Not just the best freetaker in the country, Rock has become the scorer of important goals. Gavin has options here, too.The Dublin boss could leave out his entire starting front six from the Tyrone game and still field and attack againt Roscommon containing Paul Flynn, Kevin McManamon, Colm Basquel, Cormac Costello, Eoghan O'Gara and Paddy Andrews.